San Giovanni e Paolo is a fine, huge Dominican church with the tombs of many Doges. 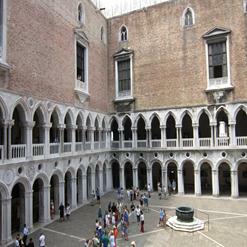 It shares its piazza with the fine Renaissance facade of the Scuola San Marco and an equestrian statue of the mercenary (condottiere) captain Colleone. Look out for the testicles (coglioni in Italian - it's a lousy pun) on his coat of arms!